Interrupts are signals that interrupt the current task being performed by the microcontroller. An Interrupt might occur based on external(a sensor senses something) / internal parameters (timer,etc). When an interrupt occurs the microcontroller pauses whatever it is doing and calls a dedicated function associated with that interrupt. This function is referred to as the ISR - Interrupt Service Routine. Once the ISR is executed the microcontroller will go back to the task it was doing and continue the process from where it paused. Consider this, You are building a fire alarm system, now, you have 2 ways of doing this, either you check the fire sensor pin manually or you attach it to an interrupt pin and write the alarm code as part of the ISR. if you check it manually, there is a chance that you might miss the signal from the fire alarm when the actual fire happens (the chances of a fire would be very less and its kind of pointless to keep checking the fire sensor) and fail to trigger the alarm. Another usage example would be a vehicle speedometer. Most vehicles use some kind of a sensor to measure the number of rotations of a wheel. These sensors would send one / multiple pulses for every rotation of the wheel, based on the number of pulses and the wheel diameter, speed and distance are calculated. Now, all these pulses must be captured for the speed / distance to be calculated correctly. If you are checking this manually, what if a pulse occurs when the control is processing the display? In such cases, you can use interrupts to automatically process those pulses as and when they occur.
" Imagine you’re sitting on your couch, enjoying a frosty brew and watching a movie after a long day. Life is good. There’s only one problem: you’re waiting for an incredibly important package to arrive, and you need it as soon as possible. If you were a normal AVR program or Arduino sketch, you’d have to repeatedly stop your movie, get up, and go check the mailbox every 5 minutes to make sure you knew when the package was there. We shall focus on using the external hardware interrupts as other types of interrupts (timers, etc) would be better left alone when working with Arduino as some of the Arduino functions are based on these. Arduino boards have several interrupts based on the microcontroller used. The Atmega328 has 2 hardware interrupts INT0(on digital Pin 2) & INT1(on digital Pin 3). attachInterrupt(Interrupt, ISR, Interrupt Type) => The attachInterrupt() function is used to attach an interrupt(INTO or INT1) to a specific function(Interrupt Service Routine) that has to be called when a specific type of interrupt(LOW / CHANGE / RISING / FALLING) occurs. detachInterrupt(Interrupt) => The detachInterrupt() function detaches or disables an Interrupt. Dual-tone multi-frequency signaling (DTMF) is used for communication over telephone lines in the voice-frequency band between telephone handsets and other communications devices. A mixture of two different frequencies - 1 High Frequency & 1 Low Frequency - is generated for each button pressed on a telephone keypad. Each button press generates a unique combination of these frequencies. When you press a button on the keypad, the communication device / decoder device at the other end can identify the key pressed based on the frequencies detected. Here's a table for easier understanding. Based on the table, when you press '1' on the keypad a mixed signal of 1209 HZ Frequency and a 697 HZ Frequency is generated. 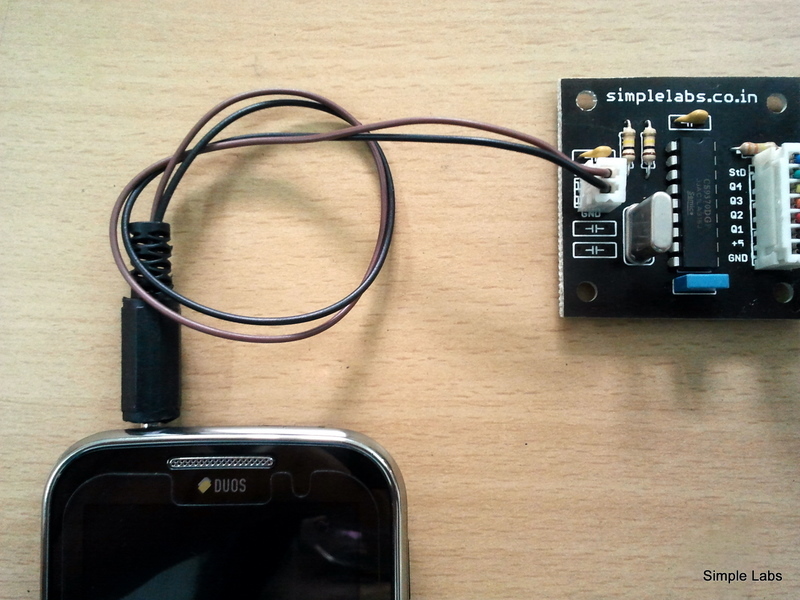 The Simple Labs DTMF Decoder board is an MT8870/C9370 based complete DTMF decoder circuit. The board has two strips of pin-out connections - a 2-pin connection for audio input and a 7-pin connection for micro-controller interface. It ships with a 3.5 mm audio jack which can be plugged into any headphone line, which on the other end could be plugged onto the DTMF decoder board. On the other end, the 7-pin connector has the following pinouts. Beyond the above the DTMF Decoder Board / Shield are functionally the same. The audio jack can be plugged into the headphone jack of your mobile(or any device that can output DTMF) that can give a DTMF output. When a key is pressed (i.e. when a DTMF tone is given as input), the StD pin gives a short pulse indicating that the output has been updated. The corresponding number is given out as a 4-bit number through 4 parallel lines, Q1-Q4. The output of the MT8870/C9370 is latched, meaning which the 4-bit output stays until the next input. That is, if you press the number 9, a short pulse would be presented on the StD pin and Q1- Q4 would have the states 1,0,0,1. The states of Q1-Q4 would not change until another key is pressed. The StD pulse is pretty short and so its better connected to an Interrupt Pin. Lets do a simple program to see the output from our DTMF board / shield onto the Serial Monitor. Now Lets try to build a Secure Device Control System - Controlling a Device using a DTMF Password. 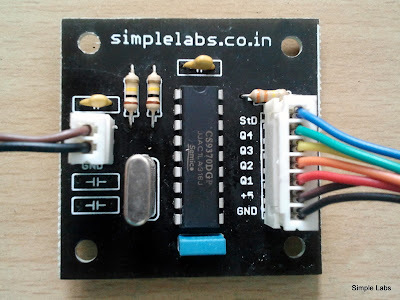 Connect a lamp to your relay board and connect the controlling wire for that to the 13th pin to have more fun. 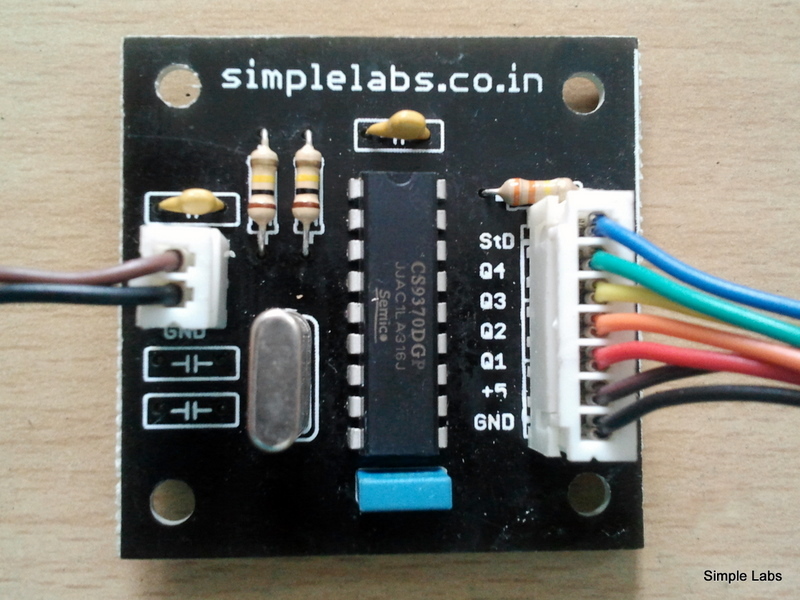 The code will work without the relay board as well. The User presses a 4 digit password. If the Password matches to a set password (set in the program) then the user is logged in. digit and the user has to start again. Reset is indicated by the led on the 12th pin. val = 0; // reset val to '0' as so that we can distinguish when a new value is received. //Get four digit input to check for login, ensure that the user is not already logged in and that 4 digits have not been input already. Looks like a great project! I'm hoping to try this out with the Arduino Uno. Is it possible to get the project to work with that specific Arduino board (the Uno), and just the Simple Labs DTMF Decoder Board, (not the entire shield)? I'm trying to make a decoder that is as simple and as cheap as possible. THANKS!!! This code is not working with my DTMF control board. I am not getting the output at serial monitor. Can You suggest anything about where I could be going wrong?? ?